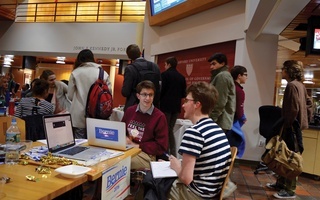 Harvard United for Bernie, the student group supporting Democratic presidential candidate Bernie Sanders, held a series of four phone banks last week in a push to contact potential voters in Iowa ahead of Monday’s caucus. 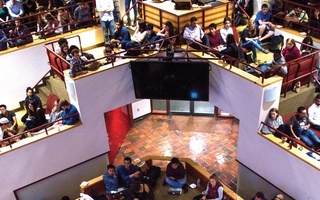 Formed by a group of Harvard undergraduates who attended a Sanders rally held in Boston last October, the group has coordinated weekly phone banks since then, according to president He Li ’16. The group now counts more than 150 members on its email list and is gaining traction, Justin G. Curtis ’19, vice president of Harvard United for Bernie, said. He added the group has also canvassed in New Hampshire in preparation for the upcoming primary there. From left: Justin G. Curtis ‘19, Sarah A. Welsh ‘19, and Graham W. Bishai ‘19 phone voters to garner support for presidential candidate Bernie Sanders on Sunday evening. With Iowa caucuses set for the following day, students participated in the phone bank throughout the weekend. “When we started calling into Iowa in October and November, people were receptive, but said they were just starting to look into the race, or that they were not thinking about it until January,” Li said. “People are paying a lot more attention now." Li said he was pleased with the weekend's turnout of nearly 15 phone bankers who made nearly 2,000 calls by the end of the push. Student callers from across the College said they supported Sanders because of his focus on issues of social justice and the middle class. Sarah A. Welsh ’19 said she was impressed by Sanders’ ability to speak to people who may not necessarily agree with his stances, and found her most meaningful conversations were those with less informed callers. “For me, to share my knowledge about Senator Sanders and his policies is very meaningful,” Welsh said. Phone-bankers were optimistic about Sanders’ chances in Monday’s caucuses. “We feel really good about his chances in Iowa," Li said. “He has this incredible ground game going on in Iowa,” Li said. 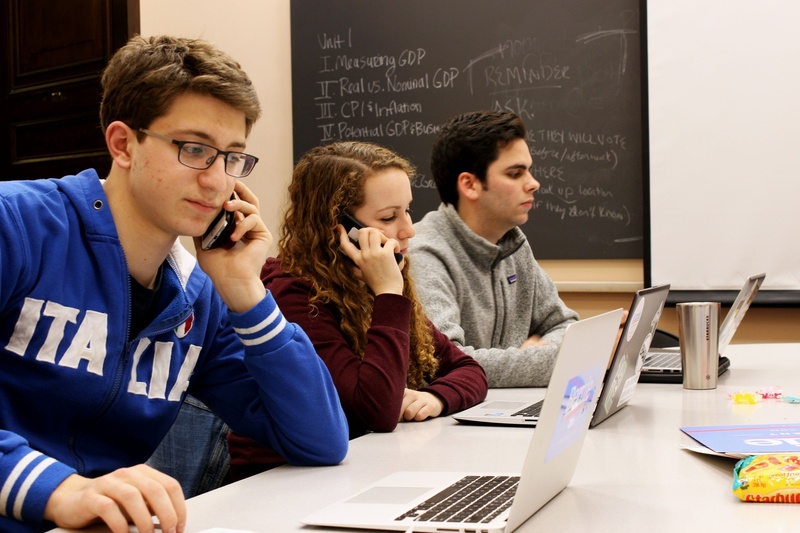 Joe Caiazzo, director of communications and politics for the Sanders campaign in Massachusetts, commended the role of college and universities in the campaign and the impact of phone bankers on campus. “I think the best way to campaign is through direct voter contact, which is through phone banks and through canvassing,” he said. “The biggest thing [college student groups] can do is encourage the student body to vote, to make an actual, conscious effort to make it easier for students to get to polling locations,” he said. 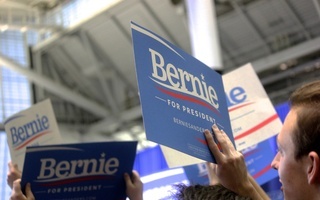 Harvard United for Bernie has also collaborated with other colleges in the Boston area to organize trips to New Hampshire to canvass in preparation for next week’s New Hampshire primary election, Li said. Staff writer Kabir K. Gandhi can be reached at kabir.gandhi@thecrimson.com. Follow him on Twitter @KabirKGandhi. I guess what I’m trying to drive home is the idea that in the U.S., not everyone gets a voice like Obama’s. Instead of forcing our tokenized black people and transgender people to silently take a seat at the table, why not encourage them to speak up? Professors stand firmly by polls' predictions for Tuesday's first-in-the-nation primary election in New Hampshire, a make-or-break moment for many presidential candidates.